I fine-tuned gear throughout the desert, but the biggest changes happened in Lone Pine, preparing for the Sierra Nevada. Here’s how my gear has changed, what I’ve sent home, and what my favorite things are. I’ve carried the men’s Osprey Atmos 65 since the beginning, and I really like it. It has remained comfortable carrying anywhere from 30 to over 60 pounds. I’ve really liked the Fit on the Fly hip belt system, and I’ve adjusted it smaller twice as I’ve lost weight on trail. I broke the buckle on the hip belt glissading recently, but easily replaced it in town. The pack is dirty and stained, but has no holes, rips, or tears so far. I carry the Nemo Hornet two-person tent, and I’ve been very pleased with it. I love having two side entrances. It has also held up really well. I’m slowly replacing the stakes, but those seem to be consumable. I replaced my sleeping bag in Idyllwild. I started the trail with an Enlightened Equipment Revelation 10 degree quilt, but was sleeping cold in it within a couple hundred miles. I’ve heard very mixed reviews on Enlightened Equipment quilts. 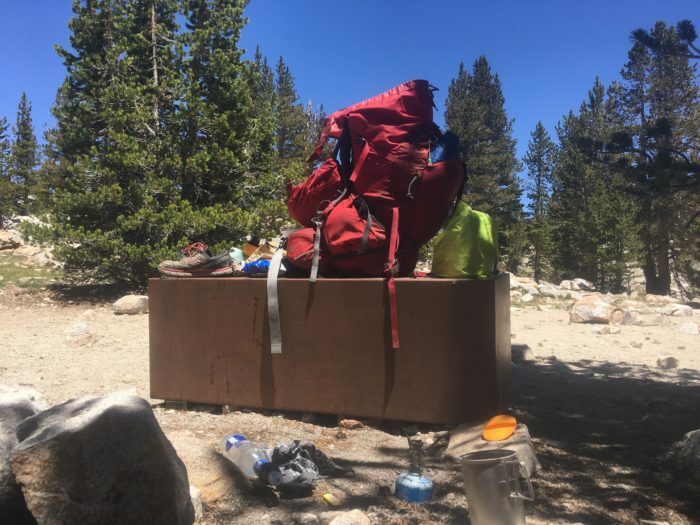 I met people who were also replacing their cold 10 degree Revelations in the desert, and I’ve met people perfectly happy carrying 30 degree Revelations in the Sierra. I switched to the Western Mountaineering Versalite, and I’ve been very happy with it. Replacing my quilt. 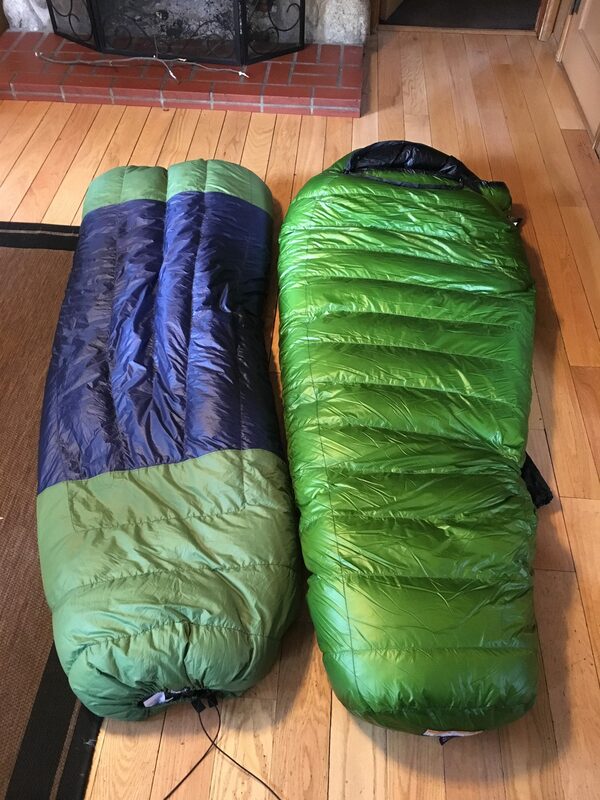 The Enlightened Equipment 10 degree is on the left, the Western Mountaineering 10 degree Versalite is on the right. I carried a Jetboil from Campo to Warner Springs, but never felt like cooking. 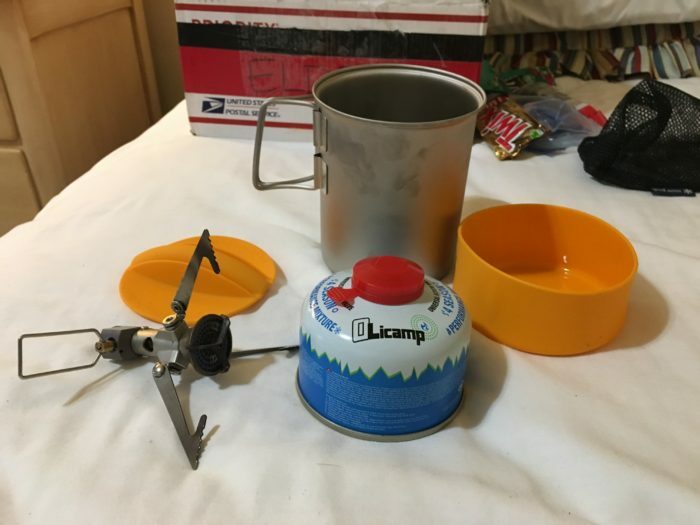 I sent it home, and later found an MSR stove in a hiker box in Wrightwood. In Lone Pine, I got a Snow Peak pot from 2 Foot Adventures. I’ve been cooking my dinners in the Sierra, and it’s changed everything. I feel more nourished and fueled during the day, and I sleep better at night. I also eat more food and generally have more energy. Huge thanks to Baloo for helping me make that switch. My new cookset. Stove by MSR, pot by Snow Peak. My clothing has mostly stayed the same. I replaced my Columbia Silver Ridge pants with some from a hiker box after I ripped the crotch out climbing over fallen trees. I added a cheap, thick beanie from a gas station, 50-cent thrift store leggings for an extra layer on cold nights, and I switched from sleeping in a T-shirt in the desert to an Under Armour ColdGear shirt in the Sierra. I’ve carried both sun gloves and winter gloves from the beginning. I switch in Warner Springs from Salomon Speedcross to Altra Lone Peak trail runners. 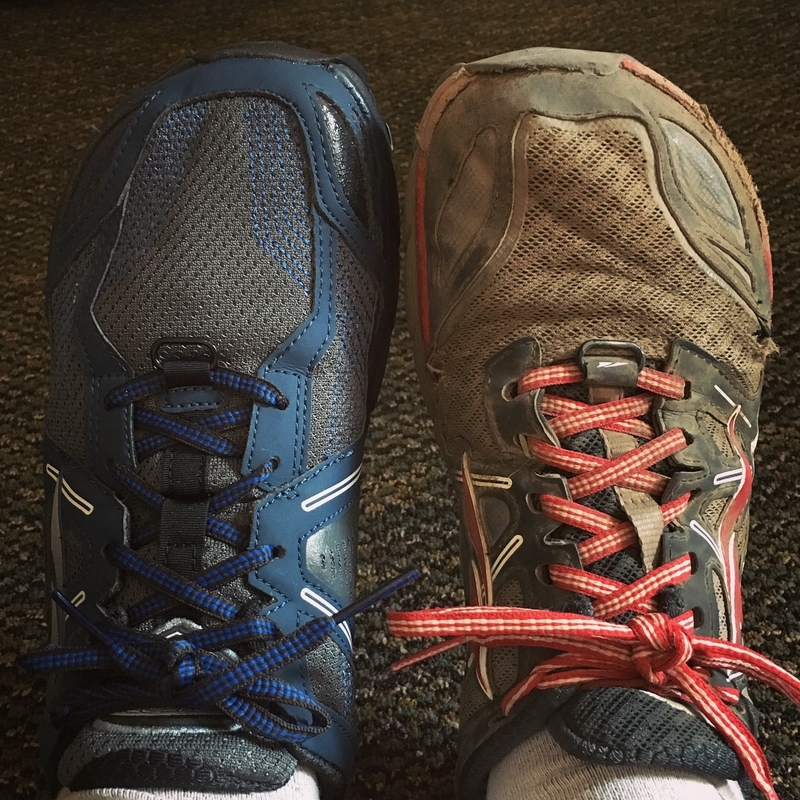 I got about 600 miles out of one pair of Lone Peaks. I carry Crocs as camp shoes, and have been happy using them for stream crossings also. I treat all my clothes with Permethrin insect repellent, and that seems to be making a big difference. Replacing my Lone Peaks in Mammoth Lakes. The one on the right hiked 600 miles, and had the holes and stench to prove it. This is a light snow year, and I met several hikers who carried no snow gear whatsoever. I chose to pack an ice ax from Lone Pine to Bishop. I carried it over the snow chute on Forester Pass because I had it on hand, but I never felt like I would’ve been in danger without it, and I never needed to self-arrest. I carried Microspikes from Lone Pine to Mammoth Lakes, and only used them on Forester Pass and Mather Pass. I really liked having them on Mather and felt very secure in them, especially on early-morning snow. Along the way, I’ve often gone through the whole pack carefully, looking to save a little weight. I’m not an ultralight hiker, but I don’t carry much extra stuff, either. So far I’ve sent home my Kindle, several pairs of Darn Tough socks, a few souvenirs, and my rain pants. I’ve also sent home a few full journals, and prescriptions I hope to not need anymore. I did a lot of gear research before getting on trail and I appreciate what I’ve got, but I don’t consider myself a huge gear nut. I do really love my new sleeping bag, the Western Mountaineering Versalite. My Sea to Summit inflatable pillow might be my best friend. I also really like the Big Agnes Pumphouse Ultra, which lets me inflate my sleeping pad without using my breath. The piece of gear that has surprised me the most is my Garmin InReach. I thought it was overkill at first because I didn’t think I necessarily needed to be able to text from the backcountry. I text with it every day; it’s been a huge morale booster. I’m able to message other hikers’ devices, and family and friends back home. Most recently, I was able to communicate with my Mom as she researched and relayed details and conditions surrounding the Lions Fire near Mammoth Lakes, CA. My pack at its heaviest, when I briefly thought leaving Lone Pine with over 60 pounds was a good idea. This was also the only time I carried the pack’s brain, which offers an extra 10-liter storage capacity. This is how much I was carrying when I crossed Forester Pass.